We wrapped up the 2018 HSRCA historic motor sport season over the first and second of December, 2018, with a magic weekend of racing, regularity and super sprinting at the Tasman Festival. Let’s take a look back at the weekend with a wrap up and a set of photo galleries. The HSRCA’s third historic race meeting of 2018 saw us rolling in to Sydney Motorsport Park for the first time this year, ready to send off 2018 in spectacular style with a magic field and packed programme. The weather mostly co-operated with our ideas, presenting a perfect summer Saturday and very nearly following up on Sunday outside of some fierce winds that blustered in for the lunch break. Thanks to an excellent entry, great support from friends, family and spectators and the club’s traditionally good-natured camaraderie, the pits and paddock buzzed with an awesome atmosphere. After our relaxed countryside meetings at Wakefield Park, the Tasman Festival was a fun bump up in energy and lived up to the festival moniker. The event kicked off on Friday afternoon with private practice hosted by Sydney Motorsport Park and the ARDC, giving competitors an opportunity to test and tune before we shifted into top gear on Saturday with qualifying and then race, regularity and super sprint events. The strong entry meant full grids and a busy schedule, and we packed as much motor sport as we could into the two days. With thanks to our amazing volunteers, conscientious driving and well-prepared vehicles, the programme ran smoothly and we kept the circuit singing all weekend long. 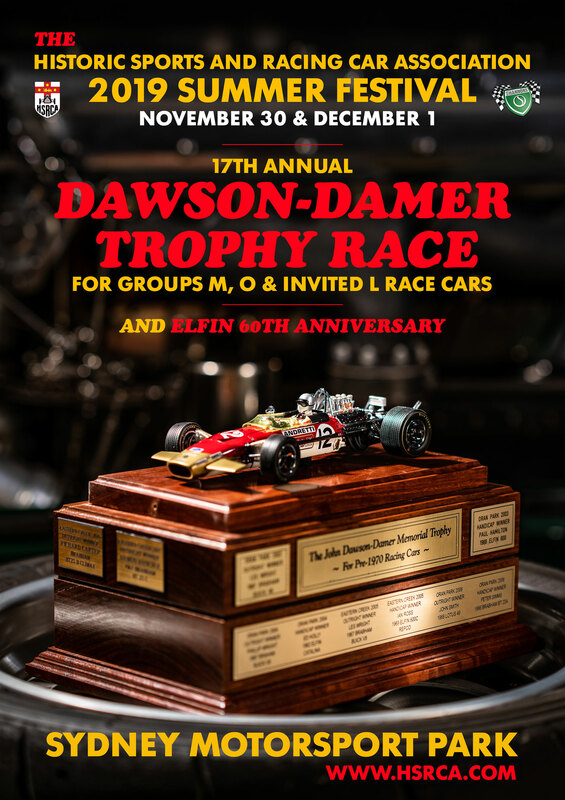 Q & R Sports & Racing, the Dawson-Damer Trophy, Group S’s action-packed endurance race and the 40th anniversary of PRB were featured at the Tasman Festival. Good fields in Q & R Sports Racing, Groups LM & O and Group S made for great feature events. It’s a joy to see the iconic early machines of L, M & O and the big wings ‘n slicks cars of Q & R running at race tracks, and we had some particularly special cars join us this weekend. The Dawson Damer trophy was won by Brabham BT23C driver Damon Hancock, with Scott Whittaker in the Milano GT2 second and Colin Haste Brabham BT2 third. The Group S endurance race is always a highlight, particularly if you’re able to catch some of the chaos of the driver change from pit lane. Group S is highly competitive and consistently presents track density fields, and Sunday morning’s race was hotly-contested throughout the field all the way to the end of the 45-minute epic. Wayne Seabrook eventually emerged victorious in his Sc Porsche 911, leading the 911 of Bryan Taylor and Sb driver Andrew Sebesfi in his MG Midget. Driving was respectful and exciting throughout the entire entry and we would like to thank everyone from Formula Vee, Group N, Groups L, M & O, Super Sprint, Formula Ford, Group S, Groups Q & R Sports and Racing and Regularity for your involvement. Attending a race meeting is a huge undertaking and all of the cars were beautifully-prepared and presented, and driving standards were high throughout. On a similar note, attending a race meeting is rarely a solo effort, so a big thank you to family, friends and teams who supported the event as well. In the paddock, we were joined by both the PRB 40th anniversary display and the HSRCA club plate run display. Both were very well attended and looked magnificent in the paddock. Huge thanks to Peter Bladwell and everyone involved in the PRB display, as well as the many club members who took part in the club display on Sunday! On that note, the atmosphere in the pits and paddock was enjoyable as always, consistently abuzz with relaxed socialising, industrious tinkering and the shared passion and appreciation for magic old motor machinery. Your welcoming and good-natured attitudes are very much appreciated! To finish on our most important thanks, a monumental amount of work goes on both behind the scenes and at each event to make these meetings happen, and it’s mostly done by volunteers. Thank you to the many volunteers who support the sport, the club and our events and make all of this possible. We’re extremely grateful for all that you do. Thank you! That said, it’s time to get stuck in to the photos and video! Put the kettle on and take some time to click through the following links and enjoy the many images contributed by the talented storytellers who cover our events. Thank you from Richard, Rod and the HSRCA Race Committee. Images thanks to Riccardo Benvenuti, Peter Dalton, Daniel Ferraro, Ken Meredith, Cori Mitchell, Seth Reinhardt, Campbell Armstrong Rider, Stuart Row, Rob Scheeren, Peter Schell and Ingo Weinberger. Riccardo’s work can be found on his website here, and Daniel’s on his website here. Peter Dalton’s work can be seen on Instagram @peterdaltonphotography. For more of Stuart’s work, see his website here and for Rob visit autofokus.com.au. Cori can be found on Facebook here and Campbell Armstrong Rider can be found on Flickr here. To reach out to Ingo, Ken, Peter or Seth, send Seth an email at [email protected]. The team at Blat Pack also joined us over the weekend, and have put together a great video that tells some of the story of the Tasman Series and shares plenty of great footage from the Tasman Festival. Hit play on the video below, and enjoy! For more from Blat Pack, check out their website here. Saturday was my first time watching the event and what a fabulous day seeing and hearing all the cars run and wandering through the pits talking to the crews. Very surprised and excited to see the Skoal Bandit March/Cosworth that I saw run at the Pocono 500 back in the 80’s! Thanks John! Glad you enjoyed the event. Hi. Great meeting really enjoyed it. Where can I find the times, class results, etc. Thanks Keith! The times and race results are available on Natsoft (http://racing.natsoft.com.au/results/). We are working on better presenting them here on the website as well.